Riviera Collection Metal Displays are trendy, classy fixtures produced to outfit hip, funky retail stores. Constructed of raw steel showing all assembly marks (welds, cuts, and joints) then clear coated for protection. The normal appearance of gun metal gray gives the line of fixtures its 'custom boutique' feel at an affordable price. Riviera Collection Metal Racks feature stylish finials. Check out our Riviera Forms and Metal Bases, which allow for countless combinations of bases and neckblock finials. For elegance in your retail store, try our Metal Jewelry Displays and Metal Counter Displays. 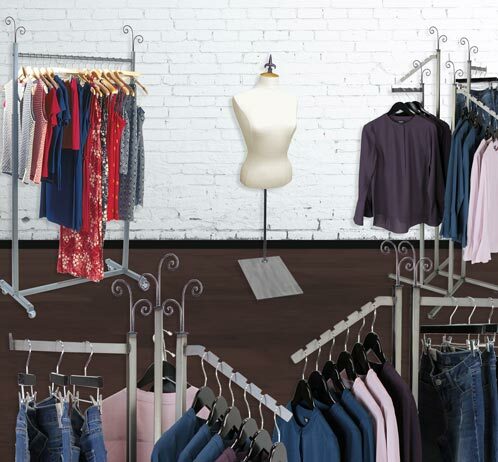 Metal Boutique Floor Displays will show your merchandise with a simple elegance. Palay Display has been supplying quality store fixtures to the retail industry since 1945!